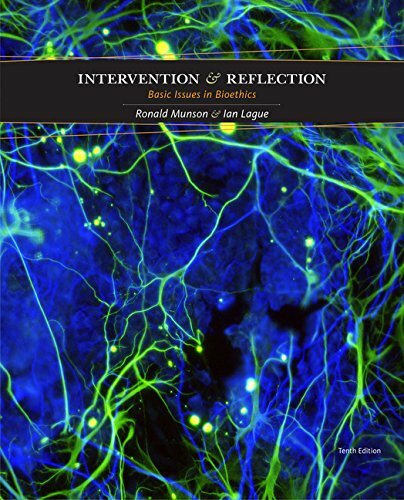 1305508408 -INTERVENTION AND REFLECTION: BASIC ISSUES IN BIOETHICS, 10th Edition offers students a compelling introduction to biomedical ethics by combining riveting human stories with clear explanations of cutting edge scientific research. A collaboration between a nationally-acclaimed bioethicist and a seasoned journalist, this textbook continues to be the most widely used bioethics textbook on the market. Each chapter includes crisp summaries of the relevant ethical theories as well as classic and contemporary articles on the most pressing topics in the field. This edition features new chapters on “Medicine in a Pluralistic Society” and the “Challenge of Global Bioethics. The accessible presentation of the conceptual debate and human dimension of today’s biomedical ethics captivates and engages students, whether they are philosophy, nursing or medical majors or have no philosophical or scientific training.